It is every parent’s worse nightmare to get a call that your child is being medevaced to the hospital. 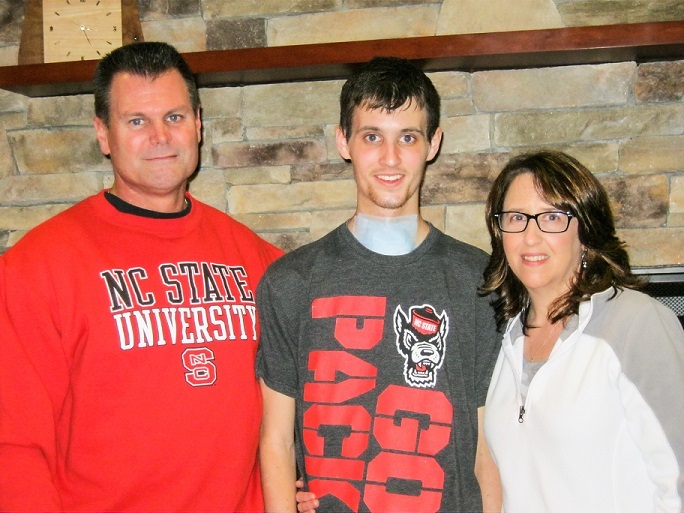 Susan and Bob Kavetski got this call: their healthy, 19- year-old son Sam, who had just finished his first semester at North Carolina State University, was being airlifted to UNC Hospitals. He had been experiencing classic flu symptoms and a sore throat, but his condition quickly worsened and left him unable to breathe on his own. He was diagnosed at Rex Hospital with Lemierre’s disease, a severe bacterial throat infection in the bloodstream that grows in the absence of oxygen. He was transported to UNC Hospitals because he needed to be hooked up to the ECMO (extracorporeal membrane oxygenation) circuit – a life-saving technique that mimics the natural function of the heart and lungs. Sam was in renal failure. He was sepsis and he had myocarditis, an inflammation of the heart. Susan and Bob immediately drove to Chapel Hill from their home in Plymouth Meeting, Pennsylvania, and spent the next month at Sam’s side, leaving Family House early each morning and returning late each night. As the manager on duty gave them a tour of the house, Susan noticed the name of her former employer on one of the donor signs: Anna Family/RESOLUTE Companies. Twenty-two years ago Susan had worked as an accounting assistant for the owner of Resolute Building Company, the builder of Family House. It gave her much comfort to know that her former boss, Dave Anna, was instrumental in building the house. Soon afterwards, she contacted him to thank him. Sam is almost fully recovered and is now back home with his parents until he returns to college this fall, where he’s an applied mathematics major. Before returning home to Pennsylvania, Susan and Bob expressed their appreciation for the team of medical professionals at UNC Hospitals who worked with their son: Dr. Sean Montgomery, Dr. Anthony Charles, Dr. Preston Rich and all the critical care nurses. Having a place to stay each night so they could be close to Sam meant the world to them. They told us they met so many kind people during their stay here – strangers, now friends, who in addition to the hospital staff, became a vital source of support during the month that they lived here. While the mortality of Lemierre’s disease is about 4.6% when properly diagnosed, the ECMO machine saved Sam’s life. At Family House we see firsthand how the biochemistry of emotion also plays a powerful role in fighting illness – and how a family’s wide network of support includes new relationships as well as those formed decades ago.